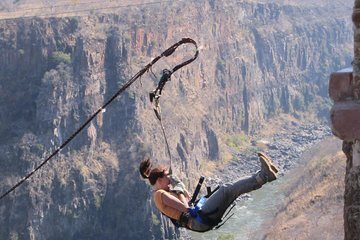 Get your ultimate adrenaline fix on this tour to the Gorge Swing at Victoria Falls. Catch sight of wildlife as you drive across Mosi-oa-Tunya National Park to reach the 311-foot (95 meter) long swing, and then drop and swing over the canyon—it’s the thrill of a lifetime. A 100% safety rate means you don’t have to sacrifice safety for fun.